If you are someone who likes to look around a city searching for art beyond the walls of museums, there is a lot for you to see in Mallorca. 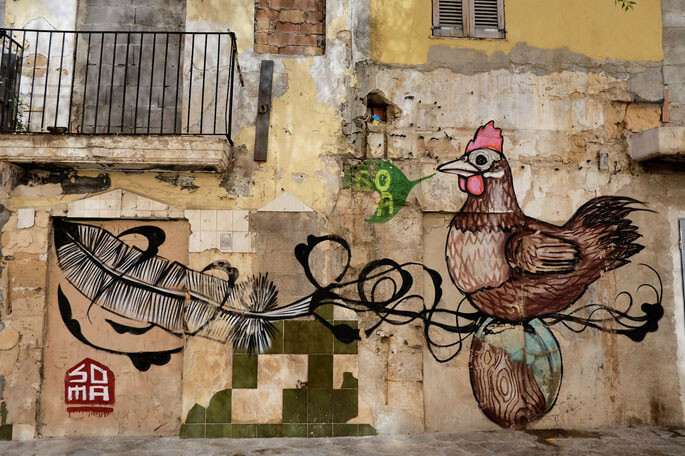 It’s not New York or Berlin, but the streets of the island’s cities and towns have begun to fill with street art, so that we are already at the point where we can recommend some of the street art routes in Mallorca that might appeal to you most. In Palma street art is not a recent phenomenon. The area known among graffiti artists as HallOfFame, located near the Son Gotleu bridge, contains some of the city’s most legendary walls, and has been painted and repainted since the 90s. It was usually an area used by the TCT group of graffiti artists, and the earliest street artists to use it were Budha, Cane and Shanghai. In recent years, quality graffiti from the PTB group has also proliferated. In the same area you can also find Coll Vell Duc Street (Josep Sureda i Blanes secondary school). Another area of renown is the Makro store: it is an area already mentioned in the book Pioneers of graffiti in Spain by Gabriela Berti (2009), since there was already graffiti there in 1989. The graffiti area of Torrent Gros de Palma should also be noted, which runs from Calle Aragón to the Atlético Baleares stadium. These areas have continued to be the usual place for the most veteran graffiti artists on the island to work, although, as pointed out by anonymous graffiti sources, "since 2015 a new generation of youngsters has been making its mark." “And in central Palma?”, you may ask. You can find street art there in Riera Park and in the Estel swimming pool building. Very close to Plaza España, next to Sóller train station, there is also a large recent mural by Joan Aguiló, the largest in Palma, while the area surrounding the train tracks also has pieces by several groups of graffiti artists. Finally, the classic zone includes Calle Sindicato and the surrounding area, so we recommend you do not hesitate to go deep into the city’s historic centre, which has always been bombarded with tags, stencils and other forms of street art. Around the city, there are good areas for street art in Mallorca, such as Riera del Puente de Inca, which has a very high wall that delights mural painters, or the Madre Alberta Bridge. Son Ferrer and Magaluf are two locations that also stand out for having walls which are decorated with a good deal of graffiti. In fact, Calvià is another nerve centre of street art on the island, to the point that art interventions are promoted by the City Council. The municipal Department of Culture created BetArt in 2012, a street art project that every year allows art interventions which seek interaction and dialogue with citizens and visitors, guaranteeing participation and creating synergies between creators, public and private entities. At the same time, they add value to the municipality by creating new tourist art attractions in areas such as Santa Ponça, Es Capdellà, Palmanova or Magaluf, during the first year of the festival's existence, and later in the Galatzó neighbourhood and in various schools in the municipality. As a result, Calvià has become a “museum of use and enjoyment for visitors and residents, which makes walking in the streets and squares of our municipality much more attractive. We want to bring art closer to citizens, and present it as something much more everyday than traditional art, without doors or schedules”, according to Natalia Ranieri from Calvià City Council’s Department of Culture, one of the people in charge of the project. BetArt already has two defined routes that run through the municipality, and include almost all interventions created since 2012. In 2018 they will include those created by the 5 artists invited to Cas Catalán, Illetes, Bendinat, Portals and Costa d'en Blanes. A catalogue of all the works will be published, with signage, maps and a route with the curator will even be offered in the 2018 edition. Those that are currently available can already be consulted on the event website.